One of the best portable role-players ever made and a joyful mix of bizarrely inventive gameplay and surprisingly sharp comedy. One of the best of the modern Mario RPGs comes to 3DS with a few new tweaks and a cute new mode, and it's just as fulfilling as ever. Mario & Luigi: Viaje al centro de Bowser + Las Peripecias de Bowsy arrives at Nintendo 3DS with the same magic, the same mechanics, and the same charm that a whole generation of players fell in love with a decade ago. If you've never played a Mario RPG before and feel stubborn about not jumping in with the SNES era, this would be an excellent starting point. But do it quickly, and make sure you catch up – this is a genre you've definitely been missing out on. An addictive and snappy game with a lot of charm, worth your time and cash. 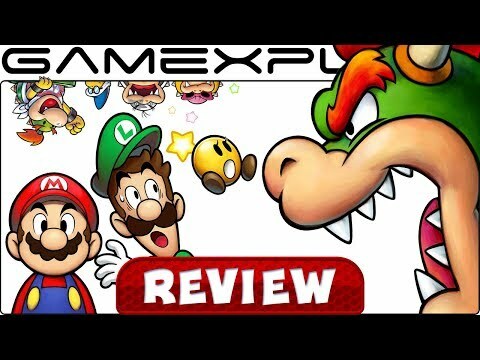 Mario & Luigi: Bowser's Inside Story + Bowser Jr's Journey is a one-two punch of fun, casual and amusing gameplay, complete with all the expected charm, humor, and challenge expected of a game in the Mario Universe. Bowser's Inside Story is one of the more odd and varied titles I've ever played, but it is a little too easy. The overall product combines several of the best game styles into one, yet the final product feels incredibly cohesive and is a must play modern Mario experience. Bowser’s Inside Story is one of the best in the Mario RPG titles and should be played. While I don’t personally think it is the best introduction to the beloved franchise—I feel like I missed a lot of little things—it was never designed to be, and it is a strong title with good gameplay, fun comedy, and a lot of memorable scenes. For me, Mario & Luigi: Bowser’s Inside Story (as well as Bowser Jr’s Journey, which, while aimed at younger children, is still entertaining) is worth the price tag. The effectiveness of the game's humor doesn't always tie back to the concept of Bowser as a frustrated, impotent vessel. Bowser Jr.'s Journey may not offer a ton of new content, but the core game is as good as ever. It might not be as enticing for returning players, but those on the hunt for a fun, relaxing RPG with quirky humor and a silly story will feel right at home. You go inside of him, so it really couldn't get any deeper than that. A great new version for one of the most beloved Nintendo's RPG games. Mario & Luigi: Bowser's Inside Story + Bowser Jr's Journey is a most have to all 3DS owners. Ten years after the original, Mario & Luigi's third adventure makes a great come bakc, thanks to its graphic renewal and the addition of a new campaign, once again staring Bowser Jr. Whether you already played the game or not, this reedition of one of the best episodes the series delivers should definitively be worth your time. Mario & Luigi: Bowser's Inside Story + Bowser Jr.'s Journey stands as a well-made remake of a game that was excellent to begin with, polishing up the original in small ways and adding some extra content that meaningfully establishes its own identity. If you've ever been a fan of the Mario & Luigi series (or are looking for a reason to dust off the old 3DS), do yourself a favour and pick this game up. Although Bowser Jr.'s Journey is just an ‘okay' addition, the inventive battles, great writing and creative gameplay of the main game make this one an easy recommendation. Already the best game in the Mario & Luigi series, the new graphics and presentation raise it to new heights on the 3DS!